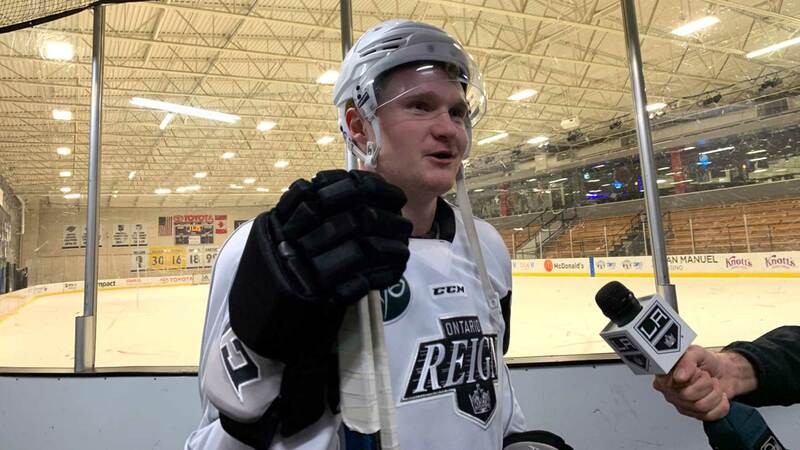 Carl Grundstrom made his debut with Ontario Reign and immediately found himself in the middle of the action. The 21-year-old Swede picked up the primary assist on Matt Moulson’s first period goal, the lone goal the Reign would score in their 6-1 loss to the San Diego Gulls. His impact came as no surprise his former MODO and Team Sweden teammate, Adrian Kempe. Grundstrom quarterbacked the power play and skated on the top line with Moulson and Philippe Maillet. He adds a scoring option to a team that has struggled to put the puck in the net, as the Reign have scored the fewest goals among all teams in the Pacific Division. With his assist against the Gulls, Grundstrom hit the 30-point plateau for the season (13-17=30). In doing so, he became just the third player to suit up for the Reign and surpass 30 points (Moulson and Sheldon Rempal). It was just one game, but Grundstrom brought a different element to the Reign in his debut. If you needed one word to describe Grundstrom, it would be that he’s a tank. Honestly. Despite only being six-feet nothing, the Swede is solid as a rock and cannot be moved. His go-to move when he first arrived in Toronto was standing in front of the net and banging in rebounds while his perimeter-shooting linemates took target practice. He was very good at his role, and as he got more comfortable with his new team, we saw some nice additions to his game. Once he got comfortable in front of the opposition’s net, he slowly began to branch out and work on his play farther and farther from the blue paint. His distributing ability from the side of the net has improved — it’s a play he uses a lot on the power play — but the most underrated part of Grundstrom’s game now is easily his shot. He has a cannon of a wrister and snapper that he’s gotten really good at using when coming down the wing off the rush. He’s got a great pair of hands that have served him really well in those tight spaces in front of the goalie, but it’s also proven useful when he comes in at speed. An immovable six-foot “tank” with good hands and a hard shot that he deploys off the rush may sound familiar for LA Kings fans. “He’s still so young, but he kinda looks like [Dustin] Brown a little bit out there,” Kempe said of Grundstrom’s style of play. Writer’s note: The 22-year-old Kempe calling the 21-year-old Grundstrom “young” made me feel older than I’ve ever felt in my life.